After announcing that House of Cards would end after its next season yesterday, today Netflix seems to have accelerated its collapse. The streaming service has suspended production on the political drama, two days after Star Trek: Discovery actor Anthony Rapp claimed in an interview with BuzzFeed News that the show’s star Kevin Spacey sexually assaulted him when he was 14. “MRC and Netflix have decided to suspend production on House of Cards season six, until further notice, to give us time to review the current situation and to address any concerns of our cast and crew,” the streaming service and producer Media Rights Capital said in a statement. 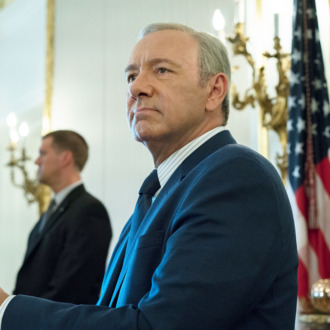 Executives from Netflix and MRC reportedly traveled to House of Cards’ Baltimore set yesterday in order to meet with the show’s cast and crew and “to ensure that they continue to feel safe and supported.” Spacey was not working on the set at the time, as previously scheduled. While the fate of what was once Netflix’s flagship series remains unclear, the streaming service is reportedly interested in developing House of Cards spinoff series. In response to Rapp’s story, Spacey issued a statement saying he did not remember the encounter in question, “but if I did behave then as he describes, I owe him the sincerest apology for what would have been deeply inappropriate drunken behavior.” He also came out as gay. Spacey’s comments have been criticized by many, including GLAAD president and CEO Sarah Kate Ellis. In response to the controversy, the International Academy of Television Arts & Sciences announced that it would no longer be giving the actor its 2017 Founders Award.